It’s a common belief that pork needs to be cooked into oblivion before humans can eat it safely. In my family, Dad is notorious for burning it on the grill. Most books say to cook it to an internal temperature somewhere between 170° and 185°. This will provide a dry and overcooked product. The misconception about how to cook pork comes from the fear of trichinosis. In the past, this was a legitimate threat and people commonly contracted it from eating pork that was under cooked. Today, trichinosis has been virtually eliminated because of legislation prohibiting the feeding of raw-meat garbage to pigs. 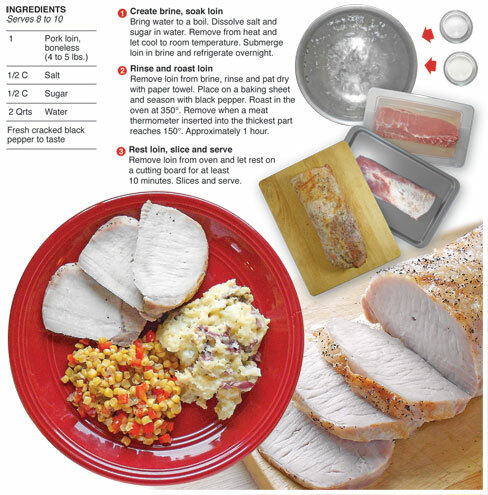 As a precaution, the Center for Disease Control says that whole pork loin should be cooked to an internal temperature of 145° and rested for three minutes to eliminate any threat. 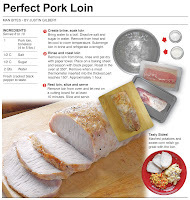 For this recipe, I soak a loin in a simple brine overnight and I roast it to 150° (a little extra just to assure my Dad it’s safe). Then rest it 10 minutes. 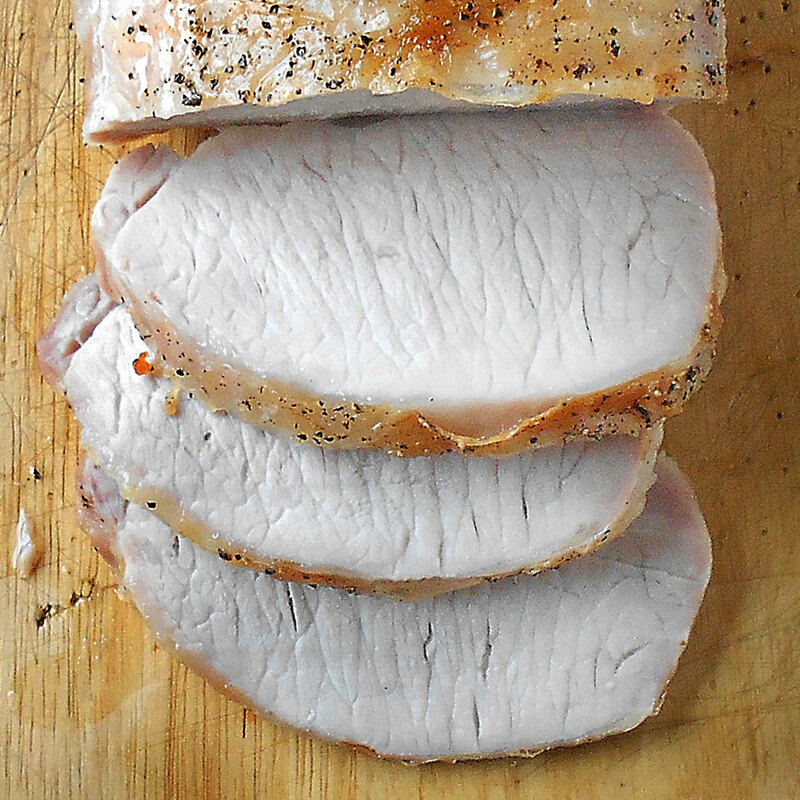 The end result – a juicy, tender and safe slice of pork. Roasting the pork to the right temperature is key to a tender and juicy bite – but the brine is equally important. I have preached about brine on this blog before. (Right here) I swear by it. It is the best way (beyond frying) to get juicy and tender pork or turkey. It was time to get the facts about pork and the temperature it is supposed to be cooked, out into the world. I have been cooking pork until it's just cooked through for years and I can't tell you how many times I have heard it's not cooked enough. I never plate uncooked or unsafe pork. I just pull it from the heat at the right temperature. People are trained to think pork needs to be destroyed in order to eat it. It doesn't. You'll never go back if you try it. For the test cook of this recipe I used the simple brine listed and then cut the loin in half and used two different rubs. What stood out after cooking it wasn't the rubs at all. It was the succulent pork! 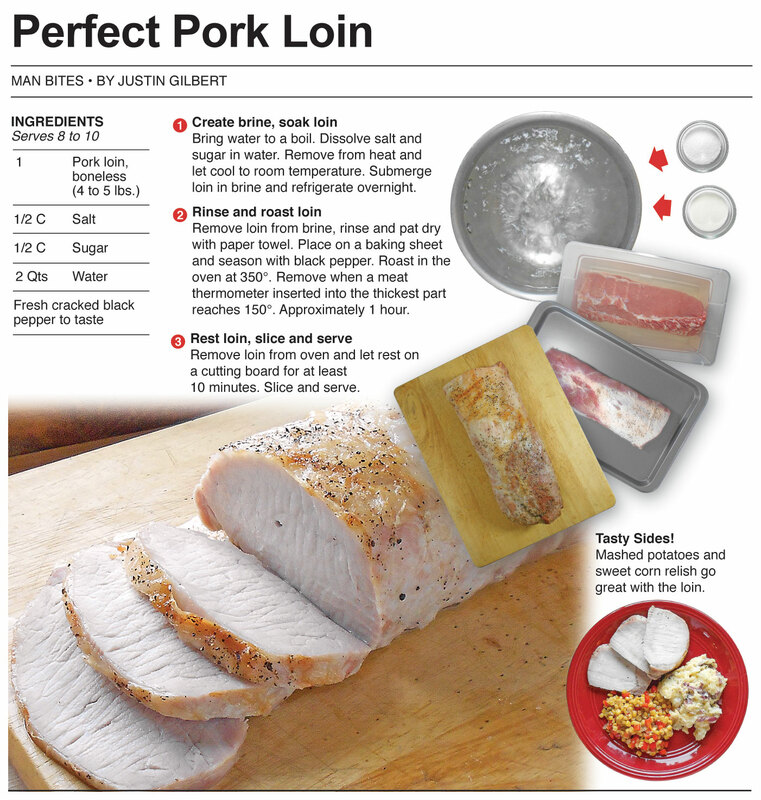 I decided then to make this column a simple and basic recipe that features perfectly cooked and seasoned pork. I can feature a new rub later on down the line. I thought it was more important to share the technique. I made an entire meal when I did the second cook. To compliment the loin, rosemary-cheddar mashed potatoes and a sweet corn relish with red pepper join the party. The step by step instruction for these recipes will be featured here in the next two posts. It's perfect for any dinner fiesta. Wrap that loin in bacon before ou cook it..... Pure heaven! Pork and Pork!